Only 90 Izmir separate Km of this picturesque village on the north coast of the Turkish Aegean. Legend has it that Amazon warriors founded several towns in the area and they raised on a small peninsula in the Bay of Aliaga was christened “City of women”. After the conquest by Mehmet the Conqueror, the city was renamed Çandarlı and wonder it's so unknown to international tourism. 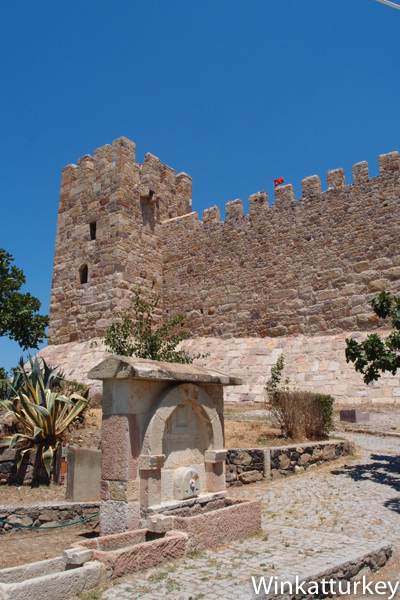 Its beaches overlooking the Greek island of Chios, the promenade full of terraces, bars and restaurants, coupled with its excellently preserved monumental Genoese castle, have a great appeal and are a highly recommended stop if we hike to Pergamum. As in the whole area of ​​the Turkish Aegean, settlements are very old Çandarlı, Some sources speak of the year 4.000 AC. His name was Pitane classic and the city met all civilizations that existed in the area, including Greek, Persians, Romans, Byzantine and Turkish. In addition, Genoese fortified the place in the year 1300 and built the castle is in superb condition. Castle is precisely the main element of distinction Çandarlı against other villas in the area. After conquering the city, Mehmet the Conqueror ordered restore strength 1450, Sultan Mahmut II did the same in 1814 and the Turkish government carried out the current renovation 1955 he returned the way he looked in the fifteenth century. It is a majestic building located a few meters from the beach, near the bazaar and with fabulous views of the bay, with Karaburun peninsula and the island of Chios in the background and the island of Lesbos right. In the bazar village shops and found it very interesting prices and articles of all kinds, excellent oil from the area and other agricultural products of very good quality, to craft, clothing and souvenirs. Narrow streets, low houses and the typical activity found in the streets around the country, join beautiful promenades on either side of the small peninsula on which stands Çandarlı. As tourism development does not seem to have come with great intensity, during the walk through the resort there is a sense of authenticity very characteristic of this northern Aegean Sea. Çandarlı beaches are one of the big surprises in store for us this tour. Especially the one facing west and closer to the castle. We found a long sandy beach along the entire coast of the peninsula, care with a boardwalk and the bars and restaurants within ten yards of sand. Not much depth, The water is usually calm and enjoyed an excellent view. We can order food and drinks at nearby bars that serve us on the beach if you prefer. Also here, prices are very convenient. Çandarli pertenece the distrito de Dikili, although it is in the same bay as the industrious town of Aliaga. To get just have to deviate 10 km from the road leading from Izmir to Pergamon, near the junction that leads the latter. A good choice to eat the sea after our visit the ruins of the city and well known, with option to swim at the beach, if the time.